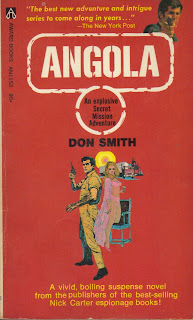 Secret Mission #9: “Angola” by Don Smith. His CIA contact asks Phil Sherman to try and find a black rebel leader in Africa and promise him money and support to back his fight for control of Angola. The only one who may know his whereabouts is an ex prisoner now living in Lisbon, so Sherman starts there. The first half of the book takes place in Lisbon, as Sherman is framed for murder and must hide out from both the police and those men who set him up. Here he meets two women, Meia Gomes and Carlotta, who provide the romantic interest while he’s trying to stay alive. When he leaves Lisbon for Angola in the second half of the book, Meia goes with him, but is kidnapped by the opposition when they arrive. 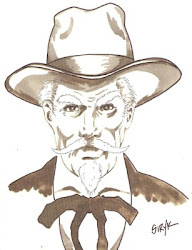 Now Sherman must seek the aid of Manuel Arrabida, the rebel leader to help him get her back. He recruits the help of an ex Green Beret training the rebels at an old Fort. Finally reaching the rebel camp he speaks with Arrabida and is introduced to the rebel’s beautiful sister, Senguela, a vicious jungle fighter. She takes Sherman under her wings to protect him, and the rest of the story revolves around her instead of Meia. I do believe Phil Sherman is better with women than James Bond. 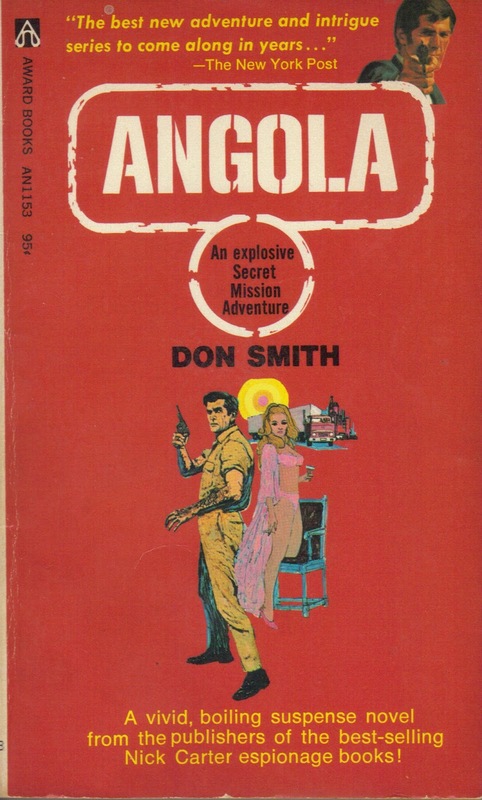 Although the first half of the book is very busy, the story really takes off when we move into Angola. Most stories are well written, and the author is well versed in world politics and geography, some of the stories do come across as a bit better than others. This is one of them, and was a fun read. Sherman is merely a CIA asset, not an agent, but willingly takes on dangerous assignments that could result in his death. Dirty Harry #4: “The Mexico Kill” by Dane Hartman (unknown author). In order for the author to make the story work, he has Harry make a false arrest on a drug kingpin, which gets him suspended from the force. 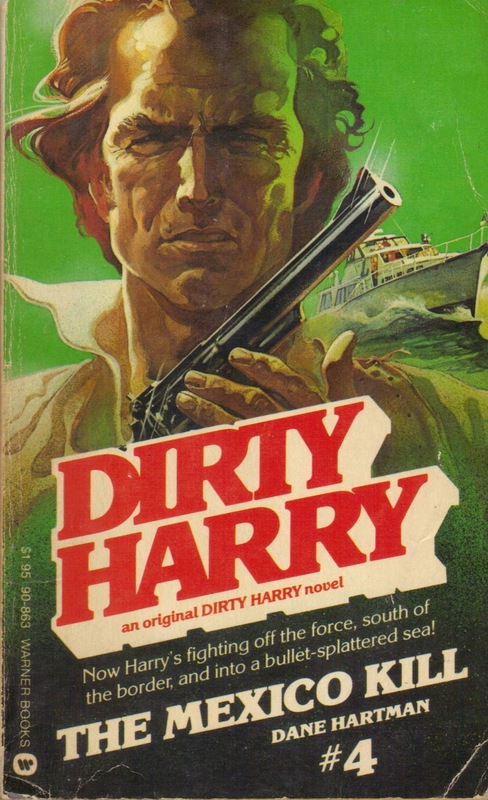 This is just in time for Harold Keepnews, an extremely rich person, to hire Harry to oversee a crew on a small luxury cruiser sailing to Mexico to get revenge on pirates who captured his previous cruiser and killed all on board. 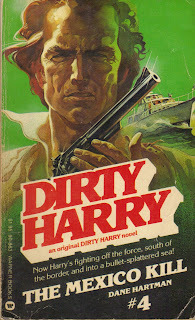 Naturally, Harry is given a crew not much better than the pirates he’s going after, plus every move he makes seems to be known in advance. Could Harold be setting Harry up, or is it his gorgeous wife, Windy working against him? Well, the plot wasn’t too bad, but the carry-through wasn’t very good. Almost as if this was intended as something besides a Dirty Harry in the beginning, but rejected, and turned into this odd entry. 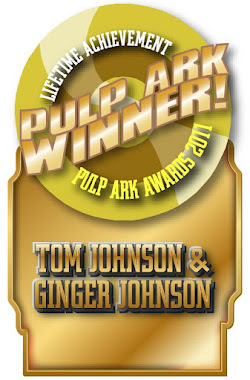 In reality it might have worked better as another men’s action novel series. I don’t think it worked well for Dirty Harry. Truth be told, the only stories in this series I seem to like are the ones written by Ric Meyers. 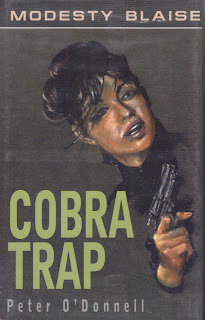 Modesty Blaise #13: “Cobra Trap” by Peter O’Donnell. This final novel actually contains five novelettes: BELLMAN, THE DARK ANGELS, OLD ALEX, THE GIRL WITH THE BLACK BALLOON, and COBRA TRAP. BELLMAN begins shortly after Modesty has taken over The Network and recruited Garvin. Modesty goes after Bellman, the man behind a drug ring responsible for many drug addiction cases with children. She can’t make the man fight her, so she’ll have a chance to kill him, so she frames him and sends him to prison. Once out he only wants revenge on Modesty and Garvin. This is a play on THE MOST DANGEROUS GAME, as Bellman captures them and leaves them without weapons on a small island, stalked by three killers: Charlie Brightstar, a Choctaw Indian; Van Rutte, a black African mercenary; and Crichton, a big game hunter. But Modesty and Garvin make their own weapons and turn the tables on the hunters. THE DARK ANGELS is a three-man team of assassins, highly trained in acrobatics. They are hired by a group of powerful British rich who want foreign investors out of English business. When a foreign company starts a building construction on British soil it’s time to kill the head honcho. Tarrant is wise to the situation, but doesn’t know who is behind the killers. Instead of asking Modesty and Willie to look into it, he tricks them by pulling a gimmick on Modesty to make her think it’s her idea. In the meantime, The Dark Angels are willing – and even anxious – to kill them and collect their pay. OLD ALEX: Modesty is on a walk-about in the Pyrenees when a sniper shoots her with a dart. She awakes in a cave, the entrance blocked by a big boulder, where she cannot escape, and is left die. But an old farmer finds her while out looking for logs with his ox. He takes her to his farm to meet all the family. There is a mystery about Old Alex: he speaks French, but throws about English words now and then, as if he wasn’t always a French farmer. Matilda the old lady that has been with him since he was found fifty years ago shows Modesty a uniform he had been wearing when they found him. He was an British flying officer, shot down in WWII, but he can only remember from the time the family here had found him, his past a complete blank. Modesty uncovers the truth, and discovers that The Salamander Four had placed a contract on her; the sniper had left her for dead. There is a lot going on in this story, several stories are unraveling at the same time, and strangely they are all connected. The Salamander Four are destroyed in this story. THE GIRL WITH THE BLACK BALOON: A group of men are kidnapping important men and holding them for ransom. When they kidnap an important British gentleman, Tarrant is able to get a man inside their group but his body is returned horribly mutilated. He was a friend of Modesty Blaise, and when she learns of the death, she decides to tackle the case with Willie Garvin. The girl with the black balloon is an innocent bystander who accidentally blows their cover, but since she has a hot air balloon with a basket, they ask her for help in getting above the castle where the kidnappers are holding their captive. But things go wrong when the captive doesn’t want to cooperate. COBRA TRAP. It’s now over 8 years since Tarrant’s death, and four years since their last serious action. Modesty is 52 years old and beginning to show her age, and they’re both slowing down. Modesty has been acting strangely also, showing more motherly love to Willie, as if holding a deep secret. Steve and Dinah, also older, with two children, are away in Montelara, Central America, when a rebel force attacks the government. 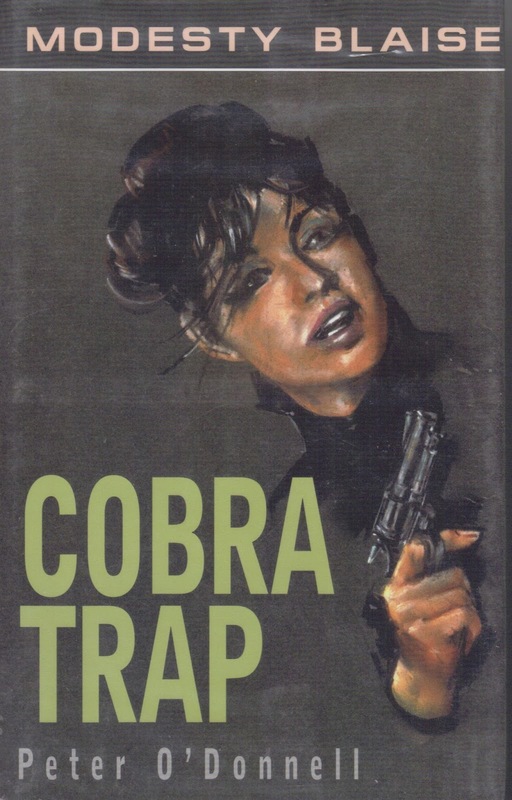 Willie is with them, and along with the government officials and a trainload of children, hope to evade the Cobra Army. Willie contacts Modesty about the situation, and she tells him she’s coming to help. The tracks are blown up before the train can reach the border, and Willie must take tracks from behind them to replace the damaged ones in front, which is going to take a lot of time, and the Cobra Army is heading for them. Modesty arrives in a small plane; bails out, letting the plane crash into a pass delaying the army, giving her and Willie time to set up a fire zone to delay them until the train can get away. Here Modesty tells him she has a tumor in her brain, and is dying, and this is her way out, and she will hold the fire zone while he returns to the train to help Steve and Dinah. It’s the way she prefers to die, instead of suffering longer with the tumor. Willie agrees, but when she dies from a gunshot would, and his ankle is damaged by a heavy rock, he sets plastic explosives and moves out, blowing a ton of dirt over her body for a grave, then moves out with the Cobras following close behind. He is picked off by a sniper in the end. Steve and Dinah successfully escape in the train. The author killed Modesty and Willie to insure no one else would ever write stories featuring them, so I can understand his reasoning, but that didn’t make it any easier to finally read of their deaths. Still, he waited until they were middle age and slowing down, even allowing Modesty a reason for dying. Of course, Willie could not have lived with her gone, so both had to die. There were only 13 novels, two of which were short story collections. The series was based on a popular comic book series by the author. The stories are all topnotch, and I highly recommend the book, but only after all the others have been read first.